M0PLA/P SOTA Activations: 28th January 2017. Brown Clee SOTA Activation visit. 28th January 2017. Brown Clee SOTA Activation visit. G/WB-002 Brown Clee Hill. 28th January 2017. This years visit to Brown Clee Hill was going to be a 2M and 20M activation as last year, The walk started from the same location with parking the car at GD SO585888 just in front of the gate and leaving room for the gate to open if required. The weather was not great for visibility as the cloud cover was low. The ground was wet and fairly muddy, so a very steady ascent was called for. We took about 45 minutes to reach the summit with 2 or 3 rest stops to catch a breather and try take in the sights between the passing clouds. As you can see from photo No 1 top left visibility was not great at the start. Jamie (my son) set up the 2M dipole before getting his cooker set up ready for warm food and drink, I tested the antenna with the analyser and was happy with the result so started to erect the Moxon for the 20M. I have now had a few people ask about the size of the Moxon so have included a few photos as seen below. As seen in the right hand photo I have now purchased a nice SOTA flag from SotaBeams, We had a few visitors during our activation and as always they wanted to know what we were doing and one of them commented on the flag. I was glad to explain the reason for the activation and the equipment as always. Towards the end of the activation the weather cleared up and we could admire the views. 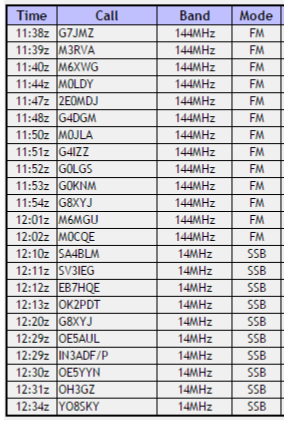 13 QSO's on 2M and 10 QSO's on 20M, so I thought a very good day. Greece being the furthest contact at 1524 miles away.